The Water System currently has 16,250,000 gallons of potable water storage consisting of: 7,250,000 elevated storage capacity available, 9 million gallons of in-ground storage available. 1986 - Lake Kedron complete and the 4 MGD (million gallons a day) Crosstown Water Treatment Plant complete; a 4 MGD withdrawal permit was issued for Lake Kedron. 1988 - Raw water intake on Line Creek, including 20-inch raw water line to the Water Treatment Plant, installed and 2 MGD withdrawal approved. 1989 - Crosstown Water Treatment Plant upgraded to a 6 MGD plant. 1991 - Starr's Mill, millpond and dam, purchased as a water source. A 2 MGD withdrawal permit was approved from Starr's Millpond. 1992 - Kelly Drive Water Plant was closed and Lake Peachtree's .5 MGD withdrawal permit was transferred to the Crosstown Water Plant. 1992 - Water System was issued a 404 permit for the Lake Horton Project in December. 1993 - Mallett and Associates begin engineering on the County Loop Line. This 32 mile, $10,000,000 project was constructed in six phases and took six years to complete. 1994 - Crosstown Water Plant expanded from 6 MGD to 8 MGD. 1994 - Construction begun on Lake Horton in September. 1995 - Withdrawal permit issued for 10 MGD from the Flint River and 8 MGD from Lake Horton. 1996 - Lake Horton complete. 1997 - Crosstown Water Plant expanded to 13.5 MGD. 1998 - Crabapple Booster pump station complete. 1998 - Started 404 permit process for Lake McIntosh. 1999 - Groundbreaking for the South Fayette Water Treatment Plant. 2000 - Radio Meter Reading program begun. 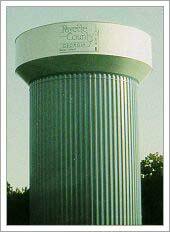 2001 - South Fayette Water Treatment Plant completed. 2002 - Hwy 92 two million gallon water tank completed. 2004 - Ellis Road two million gallon water tank completed. 2005 - Distribution Warehouse building completed. 2007 - 404 Permit for Lake McIntosh issued. 2010 – Groundbreaking January 20, 2010 for Lake McIntosh. 2012 – Lake McIntosh Reservoir Dedication (December 7). 2013 Lake McIntosh Park completed.